Red bricked streets are now relatively rare in NYC, but that doesn’t mean they always have been; while they haven’t gotten the press time that “cobblestoned” or Belgian-blocked streets have gotten over they years, in many cases, red bricks were optimum because they were flat and didn’t subject carts and wagons to occasional jolts the way uneven cobblestones, which were common in Philly and Boston, certainly did. 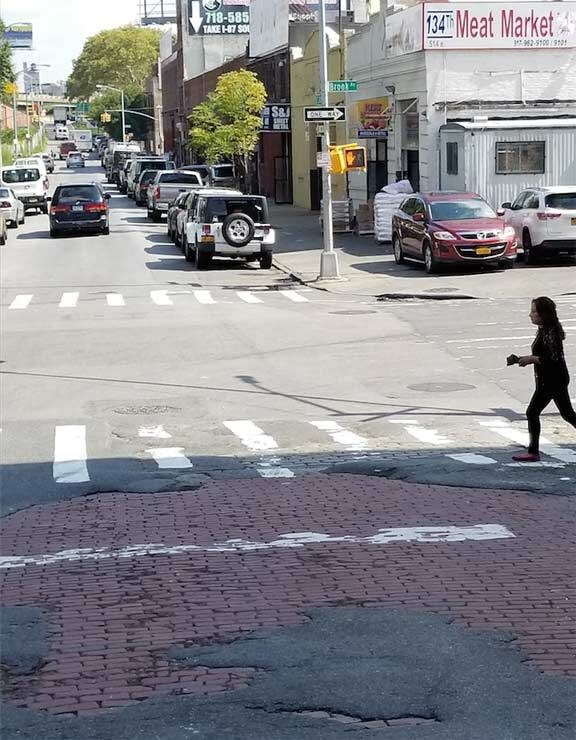 East 134th at Brook Avenue, at a Major Deegan Expressway overpass, has not been paved for several years and its former red brick pavement is showing through. Mott Haven is named for Jordan Mott, who built a tremendously successful iron works beginning in 1828 (the iron works continued to 1906), centered along the Harlem River from about Third Avenue to East 138th Street. His handiwork can be still seen all over town on airshaft and manhole covers built by the Mott Iron Works. Mott had bought the original property from Gouverneur Morris II in 1849; Morris was asked if he minded if the area was called Mott Haven, a name it had quickly acquired. “I don’t care…while [Mott] is about it, he might as well change the Harlem River to the Jordan.” The iron works produced practical and ornamental metalwork used worldwide. Before Bronx streets received Manhattan’s street numbering system in the late 1800s, East 134th was Mott Street. Brook Avenue, meanwhile, overlays a mill brook that used to flow aboveground when this was an estate belonging to the prominent Morris family. Upper Queens exits from the BQE (like 30th ave) used to be red brick.